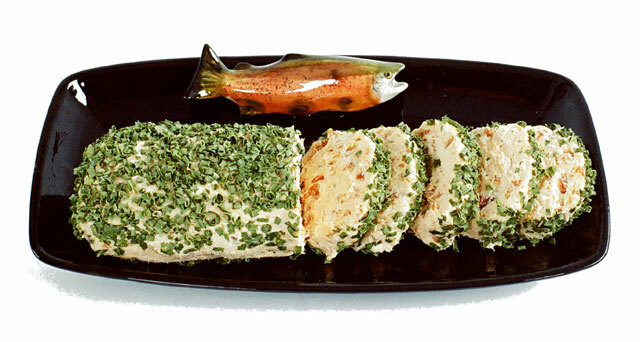 Flake Smoked Salmon into cream cheese, add chives. Blend well. Form into ball or log. Roll in parsley flakes or chopped nuts. Chill 2 to 4 hours. Serve on crackers. We've heard from our customers that this simple recipe has become a staple ( and for some a tradition) for everything from corporate holiday parties to football fans jumping up & down on the couch. You can get as fancy or as simple as you'd like for serving ~ either form a cheese log or ball, or serve from a bowl with crackers. Prepare Red Beans & Rice mix according to package directions. Add smoked salmon during last 5 minutes of cooking. Warm tortillas. Spoon mixture into center of each tortilla. Top with cheese, sour cream, salsa, & minced onion. Fold burrito style & serve! This can be a full meal in itself, or for something fun, we also suggest making little appetizer sized burritos. * Karen says she really likes Dill, so she said you may want to use a little less. Combine cream cheese, red onion, & dill. Gently flake salmon into mixture. Blend well. Can be formed into log or ball. Chill. Serve on crackers. Karen A. shared this recipe with us in 2009. It is so simple, yet it has such a great taste! In a medium size bowl, combine Ricotta, Pesto, Mozzarella, Olives, & Artichoke Hearts. Add salt & pepper to your taste. Once filling is mixed well, add smoked salmon and gently mix. Lightly oil a baking sheet. Remove plastic wrap from thawed dough & turn out onto baking sheet. Press out to form a rectangle, about 10 x 15 inches. Spread filling lengthwise in a 3-4 inch strip down center of dough. In order to "braid" the dough, you must cut the dough in strips about 1 1/2 inches wide. Begin 1/2 inch from the edge of the filling and cut out to the edge of the rectangle. At each end, fold the last strips over the filling (this helps seal the ends). Begin at either end & start "braiding" the dough, left over right, then right over left. Once braided, pinch the ends to seal. Cover again with oiled plastic wrap and let rise for 30 minutes. Optional: brush with beaten egg. Remove plastic wrap & bake at 350°F for 25-30 minutes. Let cool slightly, then slice to serve. Place garlic in a food processor and pulse to chop fine. Add spinach & pulse. Add basil, lemon juice, & olive oil and pulse to mix thoroughly. Refrigerate and use within the week. Sauté onions in butter until soft. Add salmon and tomatoes. Let simmer for 20-30 minutes with lid on pan. Season with salt and pepper to taste. Remove lid and add cream. Set pan aside. Boil pasta according to package directions, drain. Place in large serving plate/bowl and pour salmon mixture over pasta, mixing well. Sprinkle parmesan cheese on top. Serves approximately 4-6. A longtime customer brings us this recipe all the way from Italy. This was translated into english, and has been enjoyed by several generations of her family. She suggests using a Traditional Smoked Silver or Keta Salmon for a traditional Italian dish, but she also says that our Pepper Garlic Keta lends to a spicier flavor too. Enjoy!!! Cook pasta according to package directions, being careful not to overcook. Drain pasta. In a large casserole baking dish, combine all ingredients and mix well. Bake at 350º for 25 minutes. Cynthia shared this recipe with us. She describes it as "a very simple, healthy casserole". She likes the fact that all of the ingredients can be mixed right in the dish, and only needs to bake for 25 min. A quick worknight dinner.